This 50-card set relives the career of Muhammad Ali from an 18-year-old's triumphant trip to Rome, through the closing bell with Berbick in the Bahamas. 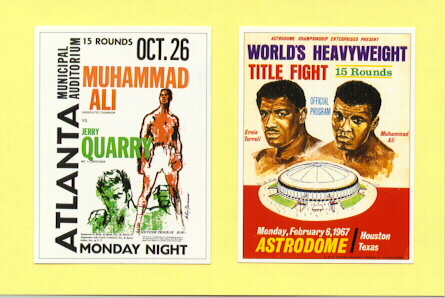 The card fronts are 50 different program cover reproductions from actual fights. The backs contain detailed descriptions by boxing historian, Tony Gee. Originally released by the Muhammad Ali fan club. A classic set.